By Mike June 15, 2016 June 15, 2016 Great Animation Clips! FastCocreate has an article up about the reasoning behind this short film Mr Seed which talks about GMO farms and a healthier food system. “Mr. Seed” is a five-minute animated short starring comedian Pete Holmes as an organic seed who goes on a cuss-filled rant on why you should consider more research on organic seed and be a bit more wary of the “GMO bros.” Chances are you’ve never thought about the sensual side of replicating drought-tolerant traits, either. Created by Austin-based agency The Butler Bros, and animation company Buck, it’s an unconventional swing to get people talking about seed. The Butler Bros. founder and strategic chief Adam Butler says Seed Matters wanted to leaven the conversation around seed, and help it become more important among people already engaged in the conversation about our food system. Tagged Animation Director, Animator, Stop Motion, Stop Motion Animation, Stop Motion Animator, The Butler Bros. The Ghostbusters girl power remake will be hitting the big screen next month, but the folks over at Digital Wizards Studios decided to pull out all the stops with their homage to the Ghostbusters franchise. Literally all the stops, because they used actual LEGOS and stop motion animation to film the five minute long clip that includes tons of cameos. Ever wondered how the Lego version of The Simpsons family would handle the Stay Puft Marshmallow Man? Well, it’s in this epic clip that also has just about every other licensed character in the LEGO Universe. Seriously, you’ll need to watch it multiple times to pick up on everything. If you’re thinking this video is completely superior to the amateur stop motion animated films you may have filmed in your youth, you’re totally right. Production of this short clip wasn’t easy nor was it cheap. Digital Wizards Studios spent over $100,000 on LEGO bricks and Minifigures. They also used the five most expensive LEGO products produced (Taj Mahal, Eiffel Tower, Statue of Liberty, Cafe Corner, Green Grocer and Mr. Gold) and in one scene over 120 unique Minifigures were used. So how long did it take? From start to finish the project took 2000 hours over the course of 5 months. Even though it’s less than five minutes, the watchability on this is so good it’ll hold you over until the feature length live action film comes out July 15. Jennifer Ruiz – Freelance Filmmaker/Photographer/Stop motion Animator. What are some of the crazier jobs you had before getting into animation? After graduating collage I had to work several summer jobs to save up for my move to California. One job was a Digital Media Summer Camp. I had to teach kids ages 7-12 how to write, shoot, and edit (on final cut) a movie. Some children were so young they didn’t even understand what editing was! Not just imagine explained final cut to a 7 year old. I get a headache just thinking about it. What are some of your favorite projects you’re proud to have been a part of? I through a fake wedding for Polaroid in a backyard a few years ago. They never ended up using it, but we spent months setting it up and it was a blast to make. The day of the “wedding” people who wanted to be in the wedding party all were randomly assigned secret roles that only they knew (groom, father of the bride, drunk ex, bride, etc). The rest of our friends were wedding guests who sat back and watched as someone was proposed to and “married.” It was full of improvised speeches, vows, a live band, dancing, a bouncy castle, a photo booth, flame throwing, guitar smashing, you know…the usual. 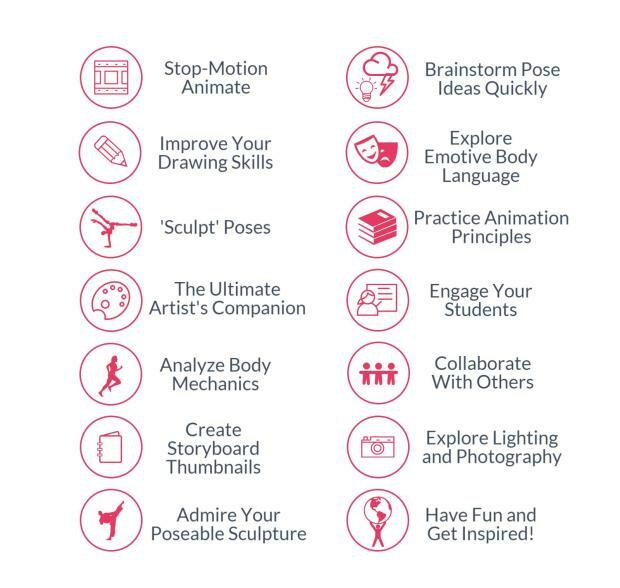 Stickybones is a highly-articulated, precision-poseable animation puppet, allowing artists, animators, students, and creatives at heart to explore expressive, gravity-defying poses quickly and easily. Stickybones is the best tool for storytellers looking to bridge the gap between your ideas to the computer. Super-flexible and extremely intuitive, Stickybones is made of engineering-grade polymers for ultimate strength combined with a sophisticated joint system, allowing you to tell your stories in a tactile, visually-engaging way. Ya gotta admit this thing is pretty dang cool! They’re in their last leg of an Indigogo campaign. Support them and let’s make this thing happen! Story: An epic action-adventure set in a fantastical Japan from acclaimed animation studio LAIKA. Clever, kindhearted Kubo (voiced by Art Parkinson of “Game of Thrones”) ekes out a humble living, telling stories to the people of his seaside town including Hosato (George Takei), Akihiro (Cary-Hiroyuki Tagawa), and Kameyo (Academy Award nominee Brenda Vaccaro). But his relatively quiet existence is shattered when he accidentally summons a spirit from his past which storms down from the heavens to enforce an age-old vendetta. Now on the run, Kubo joins forces with Monkey (Academy Award winner Charlize Theron) and Beetle (Academy Award winner Matthew McConaughey), and sets out on a thrilling quest to save his family and solve the mystery of his fallen father, the greatest samurai warrior the world has ever known. With the help of his shamisen – a magical musical instrument – Kubo must battle gods and monsters, including the vengeful Moon King (Academy Award nominee Ralph Fiennes) and the evil twin Sisters (Academy Award nominee Rooney Mara), to unlock the secret of his legacy, reunite his family, and fulfill his heroic destiny.